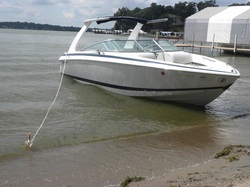 Sand Stakes help secure your boat or jet ski on the beach, whether you're boating on the river or on a sandbar on the lake. Sand Stakes prevent the current from pushing your boat sideways onto the beach on the river, backward off the beach, or from floating into the boat parked next to you. Simply place a Sand Stake on the beach on either side of your bow. Then tie mooring lines from each of your rear boat cleats to the stakes. Easier to use than an anchor. High quality powder coat finish.